To make our History Notebooks, we use a large A3 spiral bound Art Diary. We decided to separate the time-line from the writing and drawing pages so they could move independent from each other. In that way, we can turn to the Martin Luther page and move the time-line to appropriate date, showing who else lived and the events at that time. In order to make this independent time-line, we cut the page about 10-12 cm from the top, drew a horizontal line in the middle of this strip and added the dates. We calculated the number of years we were studying in the year and divided the time-line appropriately. For example, in the Renaissance/Reformation period, we covered 50 years over the double page spread. 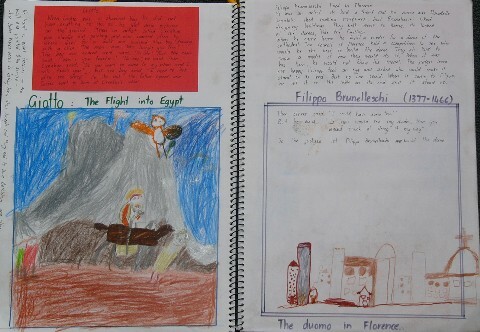 When we made our notebook on the 1800's, we covered 10 pages per double-page and this year, my son made one notebook page for each year in the 20th Century. Underneath the time-line, we add drawings, famous artists of the time, writings, essays, scientists of the time, maps, flap books, layered books and so on. 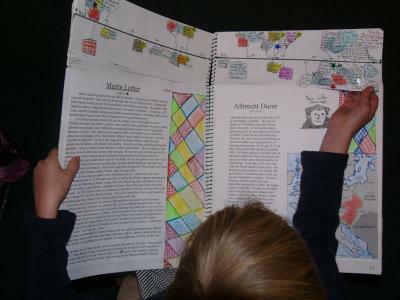 The younger children do not add a time-line to their history notebook. The Dome by Filippo Brunelleschi. I'm glad that this notebook with a separate timeline has been useful to you. I have found it a great way to add as much information as I like in the content area, but also a way to incorporate a time-line. I've been hoping that a veteran of this timeline notebooking would answer my question. I finally found it!!! Now I know we can add as much information as we want to a section of timeline without feeling cramped because of separating the timeline from the added information. I can have art, music, wars, kings and queens, whatever I want in a section instead of having limited space and feeling like I had to potentially separate subjects. WAHOO!! I like the idea of separating the timeline from the rest of the page - I think I will def. incorporate this idea as we start our timeline book this year.